No one likes having warts. They are unsightly and sometimes painful. These pesky raised lumps are actually the result of HPV or Human Papilloma Virus, a highly contagious viral invader able to enter the body through areas of broken skin. In most cases the life cycle of warts will result in them dying out eventually without treatment but quite often this can take years. 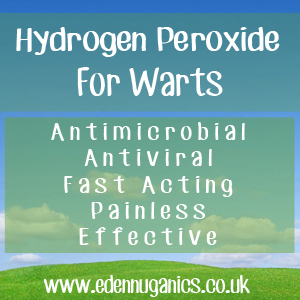 Treatment for warts is no longer available through the NHS and many of the shop bought remedies involve acids or freezing of the area; a process that can sometimes leave scarring and is relatively painful. Happily, there are a number of completely natural options that are safe for people of all ages. Common Warts - As the name might suggest common warts are the most frequently diagnosed by a huge margin. They usually appear, domed-shaped, in small groups on the hands, although they are known to grow singularly over any part of the body. Plantar warts - Plantar warts is the name given to warts found on the foot. As the warts on the foot become larger they can, on occasions, impact the patient's ability to walk. Flat warts - Lastly, we have flat warts, these are usually found on the arms, face, or legs. These small sized warts normally grow in clusters with several in one area. They have flat tops and can range in colour from light brown to pink. Hydrogen Peroxide is a remarkable liquid consisting of water (H2O) with an extra oxygen atom making the chemical structure H2O2. The extra oxygen atom makes Hydrogen Peroxide highly reactive and is responsible for its many health giving properties. When used in the treatment of warts this popular remedy is able to completely destroy the virus found at its base, which means it is unable to grow back in the future. The first stage is to remove the excess dead skin that can often be found surrounding the wart, the easiest way is to soak the affected area in water or take a shower helping to soften the skin, then lightly remove just the top layer with a pumice stone or razor blade. The goal is to expose the core of the wart as peroxide doesn't penetrate normal skin easily. Take care not to cut too far into the wart as bleeding is likely to occur. The next stage is to soak a piece of cotton pad or tissue in 3% H2O2 solution before placing it over the wart. This can then be held in place with a plaster or Duct tape. After around 30 minutes it is time to remove the plaster and move on to the next stage. At this point you will have killed a portion of the wart, however this will have only removed the top layer and not removed the virus found at the base. The white layer of skin caused by the oxidization can now be removed, again using your pumice stone or razor. It should already be loose and come away easily. Now simply repeat steps 2 and 3 until the wart is gone and you get down to healthy skin. Remember to remove all dead wart tissue along the way. If any bleeding occurs be sure to stop for half a day or so until it has healed. The Peroxide will stop your blood from clotting and can make quite a mess! Finally, you will have a nice hole where your wart once was, keep an eye out for black dots and be sure to remove them before adding a few more drops of peroxide to clean out the wound, then put a plaster on and you're done. Caster Oil and Baking Soda - These two powerful ingredients when combined are able to break down the tough exterior of the wart. Simply mix baking powder and castor oil into a paste, then apply it to the wart at night, covering it first with a bandage and then Duct tape to keep it in place. Remove the bandage the next morning. Repeat as necessary. Apple Cider Vinegar - ACV is a great remedy for warts. Simply soak a piece of cotton wall ball or gauze in raw, apple cider vinegar and cover the wart. Hold the gauze in place with Duct tape or something similar that will not come away easily or let in too much air. Change the bandage 3 times per day. Within a week your wart will harden, turn dark in colour and then fall off.